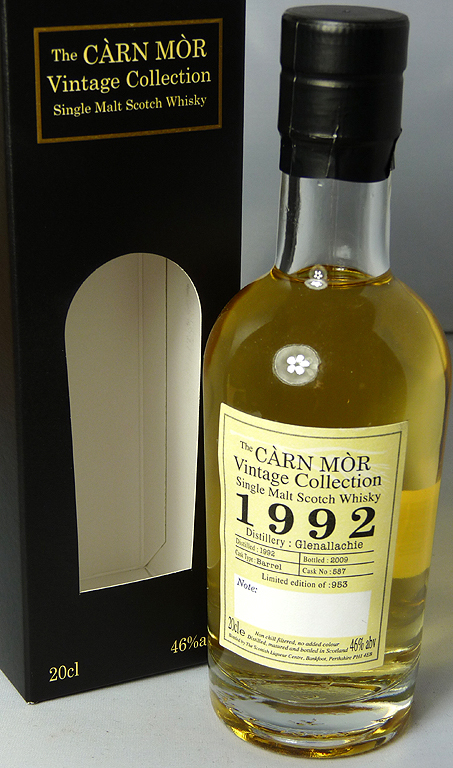 This Glenallachie is part of the 24 x 20cl bottles that make up the Carn Mor Vintage Collection. Distilled in 1992 and bottled in 2009, it’s from a limited edition of 953, Cask No: 587. Non-chill filtered, no added colour and 46%, so the makings of something very delightful! This entry was posted in Glenallachie and tagged 1992, 20cl, 46%, Carn Mor, Glenallachie, NAS, Single Malt, Single Malts Direct, Speyside. Bookmark the permalink.